To celebrate the lives of those people who take care of us and to look at how Mother’s Day is celebrated in different parts of the world. Cartoon http://www.guy-sports.com/fun_pictures/mothers_day2.jpg – you may like to have this cartoon on screen as the students arrive for the assembly. All of us have someone who cares for us. It may be a mum, dad, grandparent, foster carer, teacher, etc., but someone cares for all of us in some way. It is good to be grateful to all those that care for us, but around this time of year there is a lot of commercial hype about one particular day . . . can anyone guess? . . . Mother’s Day. Sometimes we may feel that those who care for us get rather stressed or nag a lot, but we are fortunate to have people who care. Show clip above of ‘stressed Mum’! This year, in the UK, Mother’s Day will be celebrated on 3 April. It is thought that, in the UK, Mother’s Day originated from an old sixteenth-century tradition in which people would visit their ‘mother church’ (the church they grew up in) on a particular Sunday each year. Owing to the fact that people didn’t tend to move around a lot in those days, people visiting their ‘mother church’ would be highly likely to be worshipping alongside their own mothers, who had attended the same church for many years. As time moved on, a practice developed whereby young apprentices and women in service were all allowed home each year on this weekend, which included the fourth Sunday in Lent. On this weekend families could be reunited and spend time together. Over time the Church recognized this as a special Sunday, and named it ‘Mothering Sunday’. It was also expected by the Church that people would take time to remember Mary, the mother of Jesus. Mother’s Day is now much more commercialized, but it is still a time when many families spend time together. Did you know that Mother’s Day is celebrated in most countries throughout the world? 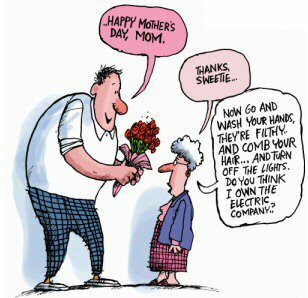 In many countries Mother’s Day has become commercialized with millions of pounds being spent on presents and cards. However, Mother’s Day has very different and varied origins in other countries. Below are the histories of it in four countries. It is the birthday of Henrietta Szold. Henrietta had no children of her own but during the Second World War she set up an organization that rescued many Jewish children from Nazi Germany. After the war it was announced that Mother’s Day would be celebrated on her birthday. First set up in 1997 to help remind people of China’s poor mothers living in many rural areas of China. China also uses this day to encourage people to show special respect to the elderly. Mustafa Amin was a well-known journalist in Egypt who founded a number of Arabic-speaking newspapers. In 1956, he introduced the idea of the country’s having a special mother’s day in his newspaper column. The idea proved very popular. This began as an event in Egypt and was later taken on by many Arab countries. In 1924 a lady called Janet Heyden began to visit a special home set up for lonely and forgotten mothers. She asked local schools and businesses to donate presents to these women to try to cheer them up. Over time, this practice was taken on by other people and eventually the idea of a Mother’s Day or ‘Women’s Day’ developed across the country. Whenever and however it is celebrated, it is right that we take time to say thank you to our mums or those who care for us. When we do so, we join with people all over the world, who share with us the joys and the sorrows that relationships bring. When did you last say thank you to someone who cares for you? Is there something that you could do or say to show that you do appreciate all the time and effort that these people put into making your life more pleasant? Help us never to forget to say thank you. and that we are grateful for the many things that people do for us. Thank you for our mums and the tireless way they look after us.